As you may know I am English but I now live near Boulder, Colorado in the US. Just a few weeks ago I went back home to England to see my Mum as she wasn’t well. While I was there I had to visit my old favourite shopping haunts in Kingston-upon-Thames and London. In nearly every shop I went in there were black and white clothes of every description. You may think to yourself that there are always black and white clothes in fashion…..well not quite like this kind of monochrome-sixties-Bridget Riley sort of vibe. 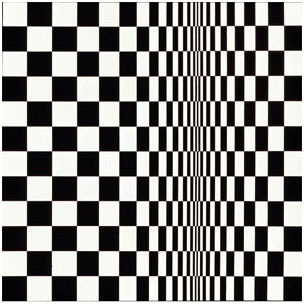 Bridget Riley just happens to be one of my favourite artists and one of the artists who inspired me during my early years while I developed my practice as an artist and painter. But also, seeing all these black and white designs made me go “hey Rowan, spot on trend” because I had just received Rowan’s latest pattern booklet Studio Issue 32. Rowan says of Studio Issue 32, “Monochrome is always in fashion and keeps coming back around on all the catwalks. 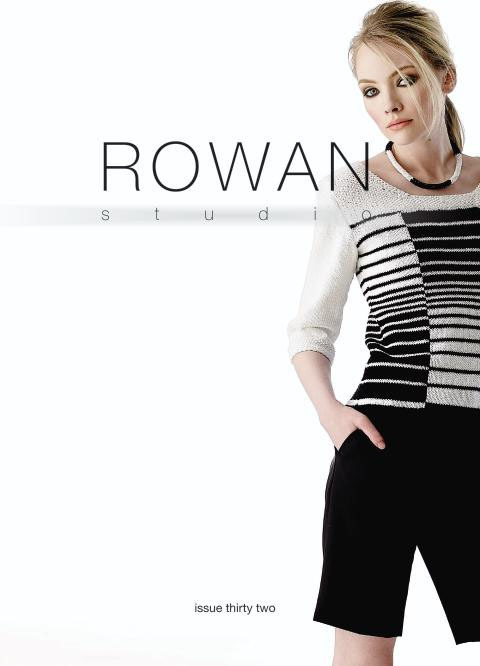 This edition of Rowan Studio shows the hand knit interpretation of this trend. Each garment has its own unique take on the black and white mix, some simple colour changes and more complex stitch patterns mean that there is a garment in this collection for all knitters from beginner to the more experienced”. I do love the sweater, pictured above, on the front cover of the booklet: Sandy, designed by Marie Wallin. It has the black and white contrast colourblock detail, moss stitch bands and three quarter sleeves knitted using Rowan’s wonderful dry handle cotton yarn, Cotton Glacé. Rowan says this knitting pattern is suitable for the average knitter. The 10 patterns in the booklet are designed by a selection of knitwear designers: Gemma Atkinson, Marie Wallin, Lisa Richardson and Martin Storey using Handknit Cotton and Cotton Glacé, both dk yarns. Here are all the patterns from the booklet….I love all the names they have chosen! 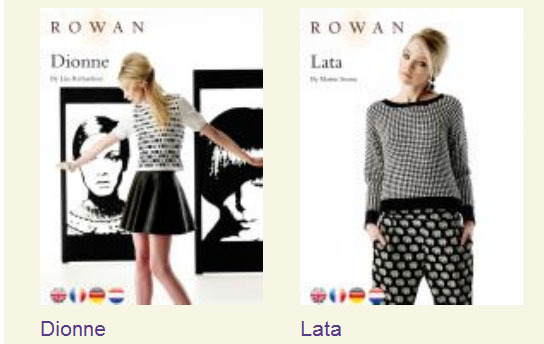 Lata, pictured below, a houndstooth check long sleeved sweater with contrast bands, is a free download as part of the Rowan Studio Issue 32 collection. Designed by Martin Storey using Handknit Cotton, this knitting pattern is suitable for the average knitter. Read on if you would like to download this free pattern. My other two favourites are Etta and Dusty pictured below. Etta, (above) designed by Lisa Richardson, displays that typical monochrome graphic detail knitted using Rowan’s Cotton Glacé. If you would prefer something a little more subtle Dusty (above), designed by Marie Wallin, is a round neck cardigan with contrasting colourblock detail to the back, cuffs and band knitting using Rowan’s wonderful machine washable soft handle cotton yarn, Handknit Cotton. Both these patterns are suitable for the average knitter. Not a fan of black and white? Try another combination. What about a ‘peaches and cream’ combination……….Bee and Ecru in Handknit Cotton? Or two blues Cloud and Yacht in Handknit Cotton. Maybe you prefer more earthy colours……..Ochre and Baked red in Cotton Glacé? Or something else in Cotton Glacé? The Handknit Cotton range has 30 colours to choose from and there are 29 colours in Cotton Glacé so you can make many different combinations. Before buying any two shades make sure you see the actual colours together in natural light. So, if you were to make one of these designs would you use black and white or choose another combination. Click on this link …… Rowan Studio 32…….. to see all the designs in detail and on these links …..Handknit Cotton and Cotton Glacé.…..to see all the different shades and let me know your choices in the comments section below. 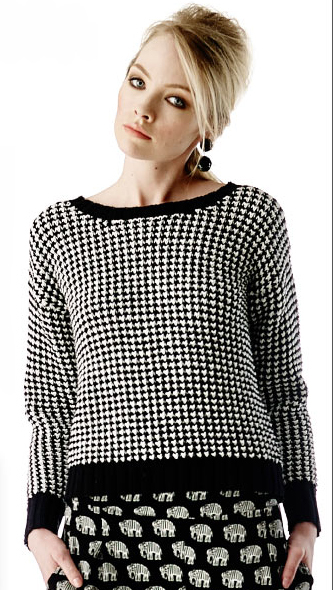 If you would like to knit Lata, the houndstooth check sweater I mentioned earlier, here’s how. You can either register with Rowan, which is free, or go the loveknitting.com and download it there. Loveknitting is also giving a 10% discount on the dk yarns until 27th October 2013 so you can buy your yarn to make this design at the same time!